Based on our client preference G&G application software development team is following Agile software development methodology in a large number of software projects. 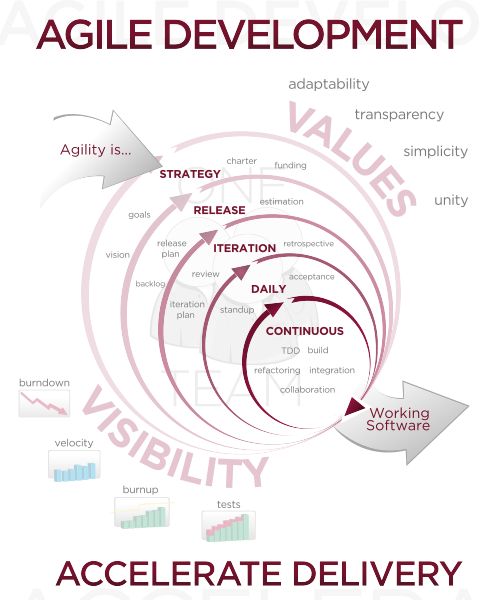 Agile methodology is an approach to project anagement that is typically used in software development. Through work cadences, known as sprints, teams respond to the unpredictability in developing software at the end of which teams must present a shippable increment of work. It attempts to provide many opportunities to assess the direction of the project throughout the development lifecycle. Agile methodology (and associated agile project management and processes) is both iterative and incremental by focusing on the repetitions of abbreviated work cycles as well as the products they yield. In an agile paradigm and agile approach, every aspect of development, from requirements to design, is continually revisited throughout the life cycle, in contrast to other methods where developers have only one chance to get each aspect of the project right. The AUP is a simplified version of the Rational Unified Process (RUP). It describes a simple, easy to understand approach to developing software using techniques from agile but at the same time remaining true to the RUP. The agile techniques that AUP applies include Test Driven Development (TDD), Agile Model Driven Development (AMDD), Agile Change Management, Agile Project Management and Database Refactoring to improve productivity. DSDM is an approach to system development which develops the system dynamically. This methodology is independent of tools which mean it can be used with both structured analysis and design approach or object-oriented approach. DSDM is a Rapid Application Development method which uses incremental prototyping. This method is ideal for cases when the requirement cannot be frozen at the start of the application building and in DSDM the requirement evolves with time. Whatever requirements are known at a time, design for them is prepared and design is developed and incorporated into system. In DSDM analysis design and development phases can overlap so this method is particularly useful for the systems to be developed in short time span. FDD is a client-centric, architecture-centric and pragmatic software process. A feature is a small, client-valued function which is the primary source of requirements and the primary input into the planning efforts. There are five main activities in FDD that are performed iteratively. An FDD project starts by performing the first three steps where the goal is to identify the scope of the effort, the initial architecture, and the initial high level plan. As with other agile software development processes, systems are developed incrementally by FDD teams.